The Brazilian Nikkeijin: Alienation and Degrees of "Japaneseness"
In recent decades, Japan and South Korea have become hosts to ethnic return migrants who have returned to their ancestral homeland after once emigrating overseas. Since the 1980s, the Brazilian nikkeijin, or members of the Japanese diaspora, have returned to Japan as labor migrants. From 1992, joseonjok, or ethnic Korean Chinese, migrant women traveled to South Korea to marry Korean men. Japan and South Korea have targeted these groups for their ethnic affinities – the attraction and kinship between the homeland population and returning migrants – on the presumption that they would integrate well into these two societies, where a "virtual equation between the state, nation, and ethnicity"2 exists. However, these ethnic affinities between the diaspora and the homeland population did not materialize. Academics such as Takeyuki Tsuda and Keiko Yamanaka, who focus on the Brazilian nikkeijin case, and Dong-Hoon Seol and Caren Freeman, who focus on the joseonjok case, have provided much anthropological scholarship on the difficulties these ethnic return migrants face upon returning "home." Unfortunately, English-language scholarship has not followed up on the pivot of both the Japanese and Korean national governments to finally address immigration integration issues that the return migrants face. In Japan, following the 2008 economic crisis, Cabinet Office issued the Nikkei Teiju Gaikokujin Shisaku Ni Kansuru Koudou Keigaku (henceforth the Action Plan for Nikkeijin Foreign Resident Policy), in August 2010. In South Korea, the Damunhwa Gajok Jjiwonbeop (henceforth the Support for Multicultural Families Act), enacted in 2008, is a broad set of regulations to improve the quality of life of foreign spouses and integrate them into Korean social life. As both countries nominally recognize the importance of multiculturalism in a globalizing world, the narrative of ethnic return migrants and their relationship with the social myths of homogeneity in their ethnic-based understandings of citizenship become lost in a generalized discourse about Japan and South Korea's embrace towards all its foreign-born residents. This is unfortunate, as the shared ethnicity between the diaspora and the homeland population challenges existing conceptions of what is foreign in ethnic societies. Considering the parallel social histories of both the Brazilian nikkeijin and the joseonjok, and the broadly similar experiences – powerful visions of ethnic homogeneity, long-term demographic challenges, and a nascent recognition of multiculturalism by the respective national governments – in both country cases, I attempt to assess the national government level initiatives to support their social integration. It also hopes to continue the ethnic return migrants' narratives that Tsuda, Seol, and others began. I argue that these national-level policy initiatives to integrate ethnic return migrants are incomplete. As token commitments to multiculturalism, the policies focus on rebuilding ethnic affinities that the homeland nation-state expects them to reproduce as descendants of the same ethnic group. However, the assimilationist ideology behind the policies perpetuate the marginalization of these individuals in a hierarchical nationhood by virtue of their shared ancestry but different cultural behaviors, because the migrants are unwilling to reproduce these expectations to earn their inclusion in their ancestral homelands. The policies also fail to reconcile the challenge to the presumed equation of ethnic identity and cultural behavior that the return migrants create for the homeland population. Since the policies are skewed in the homeland population's interests, the interests of the return migrants become invisible. A nation-state can create hierarchical nationhood through legal and social means. Visas and work permits create structures to block return migrants from receiving the same economic opportunities as 'pure' members of the ethnic group. Social expectations for legitimate ethnic behavior render the returning diaspora in the eyes of the homeland population as cultural disappointments who have become "culturally contaminated abroad. "20 The question then is whether an assimilationist integration policy can address the marginalization of return migrants by dismantling the social structures of ethnic hierarchical nationhood. 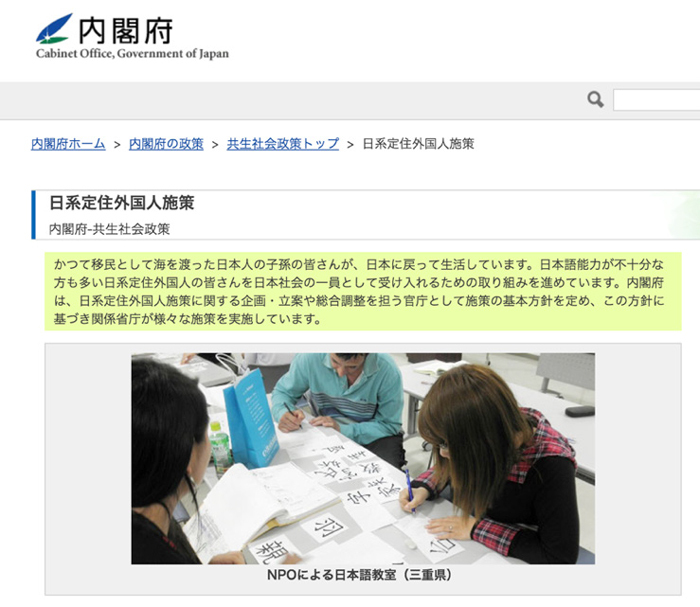 The homepage of the Cabinet Office's online portal on nikkeijin resident policy. The government thus recognized the reality for language to be not only an obstacle for accessing social services crucial for the nikkeijin's health and safety but also a tool of social oppression that compartmentalizes the nikkeijin as "second-rate Japanese" or "inadequate Japanese. "52 A language-focused policy can rebuild ethnic affinities and alleviate the Brazilian nikkeijin's status of cultural disappointment to the homeland population. Once a vicious cycle of fear and discrimination begins, it is difficult for the homeland population to stop asserting their cultural superiority and distrust towards the Brazilian nikkeijin. A June 2014 Asahi article about Oizumi during the World Cup in Brazil had the ominous sub-headline: "City and Prefectural Police on Alert for 'Overheated' Celebrations (「過熱」には警戒：町・県 警). "64 For an article that supposedly celebrated Oizumi's diversity during a major international event, the qualifying statement drew unnecessary attention to the worst fears about the Brazilian nikkeijin, compartmentalizing them as loud, unpredictable, and dangerous. 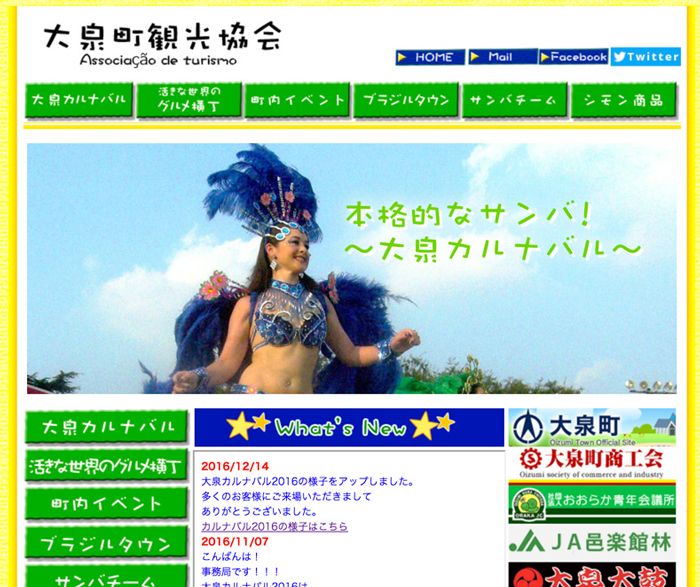 Fashion, food, and festival on the homepage of Oizumi's tourism website. Under President Roh Moo Hyun (2003-2008), the South Korean government enacted the "Policy Plan to Support the Social Integration of International Marriage Female Migrants, their Families and Children," also known as the "Grand Plan," in April 2006. It was the first policy initiative to address international marriages since joseonjok brides arrived in large numbers in the 1990s. The Grand Plan addressed issues from regulating international marriage agencies to providing support for domestic violence survivors and orientations for newly arrived foreign wives.95 The Support for Multicultural Families Act, enacted in 2008, is intended to provide the 'Grand Plan' with a legal and institutional framework. You are a beloved wife. You are a respected mother. You are a wonderful daughter-in-law. You are a valuable new citizen of Korea. The guide's longest section, on pregnancy, childbirth, and childcare, is titled "Congratulations and Welcome to Motherhood!" with the sub-text, "Becoming a mother is one of the most valuable experiences of a woman [emphasis added]. "107 In effect, the government refuses to validate marriage migrants' lives, or be their "reliable friend," unless they are mothers. Indeed, the Ministry for Health, Welfare and Family Affairs asserted in 2008 that it only wants growth in multicultural families "to curb the low-fertility and the ageing trend in Korea, especially in rural areas, by increasing the fertility rate. "108 Since marriage migrants are most likely to access these guides in their first days of Korean life to familiarize themselves with the social services available, the government, through such prescriptive messages, demands that they conform to expectations of birthing children and becoming mothers from the moment of arrival. As Figure 5 shows, newer guidebooks have removed the explicitly gendered language, but a gendered target audience remains. The 310-page 2016 Guidebook for Living in Korea: Guidance for Multicultural Families and Foreigners Living in Korea contains an extensive 58-page section about childbirth and placing children in the Korean education system, and frames information about employment with the possibility of maternity while employed.109 Furthermore, the guidebook documents Korean domestic life in painstaking detail; for example, making sticky 'Korean' rice, preventing gas-related accidents in the house while cooking, and creating a savings account to "pay for your child's tuition. "110 Implicit in the guidebook is that the Korean husband is absent to teach his migrant wife these crucial details, or even to share any of these household duties in the family. The government has to dedicate a ministry to intervene and publish this guide for migrant wives to navigate the demands of domestic life themselves. Idealized, neo-Confucian gender roles and family life form a major tenet of the Support for Multicultural Families Act. In the neo-Confucian family, the breadwinner father is absent because his engagement with work is unending. The mother, as a result, must "take care of every small emergency in the household," and produce children who are entirely dependent.113 Instead of accommodating different cultural values or lifestyles, the Act imposes a "matrifocal and childoriented [structure] that is attempting to preserve the integrity and continuity of the family" in a country that has rapidly modernized.114 Hence, under the Act, "social support for migrant women is conceptualized as a 'life-cycle service,'" from arriving in South Korea, becoming pregnant, giving birth, and entering motherhood.115 Ignoring their past careers or education, "such imagination on migrant women even justifies discrimination against those who don't fit into the norm" of knowing their domestic space in the Korean family.116 Migrant wives who face domestic violence, cultural tension, and isolation in their own homes turn to a government support system which coaxes them to remain as obedient wives, mothers, and daughters-in-law. Scholars have differing views as to why joseonjok women retain strong emotional ties to China. Kim argues that joseonjok brides experienced a certain level of socioeconomic mobility that their poorer South Korean male counterparts may not have, because "the expense of the brokerage fees…meant that the poorest of the poor among the Korean Chinese were unlikely" to be in international marriages.120 Quan offers a more nationalistic view, arguing that Yanbian is the joseonjok's true home. The joseonjok, she argues, belong in the history of communist China, developing the northeast and joining forces with the communists to drive the Japanese out of Manchuria. Since "joseonjok culture has evolved from Korean culture (chaoxianzhu wenhua you bieyu hanguo wenhua), Quan finds little reason to doubt why Korean gender roles are alien to joseonjok women. Granted, it is impossible to generalize the experiences of joseonjok women. Further ethnographic research is needed to confirm or challenge both perspectives. Nonetheless, joseonjok women struggled in a Korean society organized along patriarchal and hierarchical lines. In China, they supported "their families through both paid productive labor and unpaid domestic labor" in China.121 Some brides came from Chinese factories where they worked, ate, and spent leisure time alongside men as equals. Consciously being male or female was never a part of these friendships.122 Interestingly, Freeman found that some parents of joseonjok women in Yanbian drew on their diasporic bonds – specifically, their ethnic-based knowledge about the Korean family system and its wifely responsibilities – to discourage their daughters from even entertaining the idea of marrying Korean men.123 The flashpoint for domestic violence in the marital household was precisely the joseonjok women's competing construction of gender. According to one joseonjok wife informant in Quan's study, her Korean husband believed that verbally contending with him was not behavior fit for a woman, and that she would "definitely be soliciting violence (najiu kengding zao baoli)" if she lost her temper.124 The Support for Multicultural Families Act, therefore, is unlikely to reverse the alienation and tension joseonjok women feel with their partners. Whereas the Korean husband or mother-in-law privately enforced the joseonjok wife's demarcated space, the Act now officially endorses such rigid gender roles as a method of immigrant integration into Korean society. Minjeong Kim provides a cynical view. Marriage is closely related to Korean hegemonic masculinity, which Korean men struggle to fill if they remain single. Bachelor farmers drew national attention to their suffering by committing suicide in protest in the 1980s.125 International marriage compensates for such "disabled manhood" by allowing unmarried Korean men to achieve "adult status by marrying, by fathering children, and by earning enough to provide for his family. "126 Therefore, if joseonjok women were not obedient wives and reproductive mothers, Korean men stood to lose social acceptance in their families and communities. Thus, the Support for Multicultural Families Act is not so much reconciling the cultural tensions and potential for domestic violence as perpetuating a destructive vision of hegemonic masculinity. Another problem the Act poses is that it equates culture and race, thereby marginalizing the joseonjok out of the government's contemporary "multicultural" focus. While the Support for Multicultural Families Act is an integration that applies to the joseonjok, it is not tailor-made for them. It is for all marriage migrants, regardless of nationality. Korean government publications about multicultural families reinforce the notion that the foreign brides are not Korean and have to discard their non-Korean cultures to successfully integrate in Korean families (Figure 6). In the 2007 version of the Ministry of Health and Welfare's guidebook for marriage migrants, the foreign bride has a perceptibly darker skin tone than her Korean husband. The same ideology continues in a 2015 issue of a bilingual magazine on diversity called Rainbow+ published by the Ministry of Gender Equality and Family, an article about multicultural families ironically shows seven women in national dress and name tags with country flags to emphasize their non-Koreanness. On the same vein, the 2016 Guidebook for Living in Korea tells marriage migrants that it takes a week to get used to 'Korean rice,' which is "stickier than Southeast Asian rice. "129 By emphasizing the differences between 'them' marriage migrants and 'us' Korean citizens, the images reinforce the notion of a distinct Korean race. The multicultural family, in practice, is in reality a multiracial family. The Support for Multicultural Families Act and its associated didactic guidebooks are supposed to help these women assimilate into the Korean ethnic nation and lose their distinctive, non-Korean characteristics. It is unclear where joseonjok women fit in an integration policy focused on incorporating non-ethnic Koreans. The following quote in a 2015 study from a Ministry of Justice official is revealing: "Migrants with different ethnicities are enemies of national solidarity…By contrast, there is no need to worry about the adaptation of ethnically Korean migrants. They are just Korean like us [emphasis added]. "130 The remark illustrates not only the depth to which that government official believes in a unified Korean race, but also the continuing reality of the joseonjok's hierarchical nationhood under a supposedly multicultural Korea. Despite extensive anthropological research in the past decade that points to the contrary, the government remains in a cognitive dissonance about the joseonjok's ethnic affinities. Precisely because they are ethnic Koreans, joseonjok women do not need any special attention – the Korean families they are marrying to in South Korea are no different than the families in Yanbian by virtue of their common ancestry. In this context, ethnic kinship is oppressive. The homogenizing discourse of the single Korean race is so strong that the homeland population does not even realize that the joseonjok have cultural differences. Further fieldwork is necessary to answer why the government would introduce a policy that further marginalizes the experiences of joseonjok women and international marriages. In the meantime, Hyunok Lee and Sookyung Kim offer a bleak perspective. The Korean government's commitment to multiculturalism is not sincere, because it has an instrumental political goal. Politicians in areas with serious population decline will aggressively promote multicultural families to prevent constituencies from being merged, and therefore, elected positions from being eliminated.131 Nationally, the multicultural family "has been used instrumentally to project an increased openness of Korean society. "132 If the union of a foreign bride and a Korean man represents a new, 'open' Korea in a globalizing world, then joseonjok brides are irrelevant to that project, since they do not appear 'foreign' in racial terms, and therefore cannot contribute to the national image of an internationalized Korea. Analyzed holistically, the Support for Multicultural Families Act perpetrates a two-tiered hierarchical nationhood on joseonjok women. It first subsumes migrant women's issues into family policy. In creating support structures to support the women through the context of families, the government prescribes that the success of international marriages depends on whether the foreign bride is willing to fulfill the expectations of being a Korean mother for the family and for the Korean nation. Those expectations conflict with how joseonjok women view their roles vis-à-vis their husbands in a marital household. The Act then obscures their presence in Korean families through a broader focus on multiculturalism, even though the joseonjok were targeted as ideal brides with ethnic affinities. Although there remains a plurality of joseonjok brides in international marriages, the Act does not address the possibility that a person's ancestry and cultural behavior are unrelated. In other words, the needs of joseonjok women are rendered invisible. Political motivations, and not responding to problems foreign brides face in Korean families, perhaps explain why South Korea is interested in protecting and promoting international marriage through the Act. The ethnic return migrants therefore remain in a state of hierarchical nationhood, because the homeland population fails to consider the possibility that joseonjok spouses may not necessarily be socially compatible with their Korean husbands even if they are coethnics. As a result, the homeland population continues to create expectations based on beliefs of a Korean race that joseonjok women will not fulfill. Two decades after importing Brazilian nikkeijin workers and joseonjok spouses for their respective national goals, both Japan and South Korea have each created national-level policies to address social problems that both groups of migrants have faced, representing a new chapter in both countries' relationships with their ethnic return migrants. I have attempted to demonstrate that the Nikkeijin Action Plan and the Support for Multicultural Families Act do not address thoroughly the structures and attitudes among the homeland population that invited prejudice and isolation when they first returned to their ancestral homelands. The policies set ethnic-based expectations that do not cater to the interests of the migrants themselves, especially when the return migrants no longer feel the ethnic affinities they once had with the homeland population. Barring no further changes to these policies, I predict that in the long run the Action Plan and the Support for Multicultural Families Act will continue to place both populations in a hierarchical nationhood, and they cannot achieve more than a superficial level of social integration. One shortcoming built into this study is that because the policies are so new, their effects on return migrants are not yet fully stable. My assessment of the integration structures that the policies is based on past anthropological work conducted before the Japanese and South Korean governments made the policy pivot to multiculturalism. Evidently, further fieldwork is necessary to formally measure the degree to which the Nikkeijin Action Plan and the Support for Multicultural Families Act have facilitated integration along such dimensions such as civic and political participation, economic life, and the use of social services, which this paper did not have the benefit of accessing. However, I have also shown that discussions about integrating the nikkeijin and joseonjok require focus on not only socioeconomic indicators but also anthropological perspectives – reconciling intangible, existential questions of identity and belonging stemming from their ancestry and migration experiences. How integration structures affect the return migrants' self-identities, the homeland population's attitudinal values towards the return migrants, and the dichotomy of the return migrant as "conceptual anomaly" require attention in future anthropological research. If globalization is the antithesis of nationalism, then the two policies present an apparent paradox: given that Japan and South Korea both have low birth rates and declining labor force populations, successfully integrating migrants into Japanese and Korean society is literally a matter of national survival. In addition, the normative question of whether and to what extent should migrant-sending states be responsible for their diasporas. After all, Japan was directly involved in creating the Brazilian Japanese diaspora, and the transborder joseonjok community in China expanded during a humiliating time in Korean history. What level of immigration integration is desirable, or even necessary to be considered integration beyond the 'cosmetic'? As both countries seek to attract and import more people from abroad, xenophobia, discrimination, and conflict could embroil these ethnic nations if the government does not work to broaden existing conceptions of citizenship and membership in mainstream society. Kenneth Lee is a senior at Georgetown University from Hong Kong majoring in international politics and minoring in Japanese. He completed this paper as part of his Asian Studies Certificate from the School of Foreign Service. Burgess, Chris. "'It's Better If They Speak Broken Japanese': Language as a Pathway or an Obstacle to Citizenship in Japan?" In Language and Citizenship in Japan, edited by Nanette Gottlieb, 37–57. New York: Routledge, 2012. Cabinet Office, Japan. "Nikkei Teiju Gaikokujin Shisaku Ni Kansuru Kihon Shishin (日系定住外国人施策に関する基本指針)," August 31, 2010. http://www8.cao.go.jp/teiju/guideline/pdf/fulltext.pdf. ———. "Nikkei Teiju Gaikokujin Shisaku Ni Kansuru Koudou Keigaku (日系定 住外国人施策に関する行動計画)," March 31, 2011. http://www8.cao.go.jp/teiju/guideline/pdf/fulltext-koudo.pdf. ———. "Nikkei Teiju Gaikokujin Shisaku (日系定住外国人施策)." Accessed December 11, 2016. http://www8.cao.go.jp/teiju/index.html. Chiharuya. "Oizumimachi Kankyo Kyokai (大泉町観光協会)." Accessed December 19, 2016. http://www.oizumimachi-kankoukyoukai.jp/index.html. Chizu, Fukui. "Nanbei Nikkeijin Ni Kakawaru Mondai To Kaketsusaku No Ichi Kousatsu (南米日系人に関わる問題と解決策の一考察)." Takasaki Keizai Daigaku Ronshu (高崎経済大学論集) 52, no. 2 (2009): 71–87. De Carvalho, Daniela. Migrants and Identity in Japan and Brazil: The Nikkeijin. London: RoutledgeCurzon, 2003. Flowers, Petrice R. "From Kokusaika to Tabunka Kyosei: Global Norms, Discourses of Difference, and Multiculturalism in Japan." Critical Asian Studies 44, no. 4 (2012): 515–42. doi:10.1080/14672715.2012.738540. Freeman, Caren. Making and Faking Kinship: Marriage and Labor Migration between China and South Korea. Ithaca: Cornell University Press, 2011. Fujita, Taro, and Ippei Nakada. "Burajiru Ouen, Takamaru Netsu (ブラジル応 援、高まる熱)." Asahi Shimbun, June 7, 2014, Morning edition, sec. Shakai (社会). Han, Kyung-koo. "The Anthropology of the Discourse on the Koreanness of Koreans." Korea Journal 43, no. 1 (2003): 5–31. Higuchi Naoto. "Keizaikiki To Zainichi Burajirujin: Nani Ga Tairyou Shitsugyou Kikoku Wo Motarashita Noka (経済危機と在日ブラジル人 : 何が 大量失業・帰国をもたらしたのか)." Oohara Shakaimondai Kenkyujo Zasshi (大原社会問題研究所雑誌), no. 622 (2010). Hong, Yihua, Changzoo Song, and Julie Park. "Korean, Chinese, or What? Identity Transformations of Chosŏnjok (Korean Chinese) Migrant Brides in South Korea." Asian Ethnicity 14, no. 1 (2013): 29–51. doi:10.1080/14631369.2012 .703074. Inaba, Nanako, and Naoto Higuchi. "Ushinawareta 20 Nen: Zainichi Nanbeijin Ha Naze Kyugen Shitanoka (失われた20年: 在日南米人はなぜ急減したの か)." Ibaraki Daigaku Jinbun Gakubu Kiyou Jinbun Komyunikeshon Gakka Ronshu (茨城大学人文学部紀要人文コミュニケーション学科論集) 14, no. 1 (2013): 1–11. Izawa, Yasuki. "'Tabunka Kyousei' no Sogo: Zainichiburajirujin No Genjou to Shisaku No Seigou/Fuseigou (「多文化共生」の齟齬 : 在日ブラジル人の 現状と施策の整合/不整合)." Toyo Daigaku Ningenkagaku Sougoukenkyusho Kiyou (東洋大学人間科学総合研究所紀要), no. 15 (2013): 85–100. Japan Center for International Exchange, Toshio. "'Tabunka Kyosei To Gaikokujin Ukeire' Ni Kansuru Jichitai Ankete (「多文化共生と外国人受け入れ」 に関する自治体アンケート2015調査結果報告書)." Tokyo, Japan: Japan Center for International Exchange, November 27, 2015. Joppke, Christian. Selecting by Origin: Ethnic Migration in the Liberal State. Cambridge, Mass. : Harvard University Press, 2005. Kashiwazaki, Chikako. "Multicultural Discourse and Policies in Japan: An Assessment of Tabunka Kyōsei." The Gakushuin Journal of International Studies 3, no. 1 (2016): 1–15. Kim, Gyuchan, and Majella Kilkey. "Marriage Migration Policy as a Social Reproduction System: The South Korean Experience." In Family Life in an Age of Migration and Mobility, edited by Majella Kilkey and Ewa Palenga-Möllenbeck, 137–61. Migration, Diasporas and Citizenship. Basingstoke: Palgrave Macmillan, 2016. doi:10.1057/978-1-137-52099-9_7. Kim, Hyun Mee. "The Emergence of the 'Multicultural Family' and Genderized Citizenship in South Korea." In Contested Citizenship in East Asia: Developmental Politics, National Unity, and Globalization, edited by Kyung-Sup Chang and Bryan S. Turner, 203–17. Oxon: Routledge, 2012. Kim, Jaeeun. Contested Embrace: Transborder Membership Politics in Twentieth-Century Korea. Stanford University Press, 2016. Kim, Minjeong. "South Korean Rural Husbands, Compensatory Masculinity, and International Marriage." Journal of Korean Studies 19, no. 2 (2014): 291–325. doi:10.1353/jks.2014.0030. Kim, Sookyung. "Soft Talk, Hard Realities: Multiculturalism as the South Korean Government's Decoupled Response to International Migration." Asian and Pacific Migration Journal 24, no. 1 (March 1, 2015): 51–78. doi:10.1177/0117196814565165. Kondo, Dorinne K. "Dissolution and Reconstitution of Self: Implications for Anthropological Epistemology." Cultural Anthropology 1, no. 1 (1986): 74–88. Koopmans, Rudd, and Paul Statham. "How National Citizenship Shapes Transnationalism: Migrant and Minority Claims-Making in Germany, Great Britain and the Netherlands." In Toward Assimilation and Citizenship: Immigrants in Liberal Nation-States, edited by Christian Joppke and Ewa Morawska, 195–238. Basingstoke: Palgrave Macmillan, 2003. Korean Institute for Healthy Family. "Multicultural Information: Multicultural Families Statistic." Danuri. Accessed November 29, 2016. http://www.liveinkorea.kr/homepage/en/multidata/statisticsFamily.asp?language=EN&mc=M0031. Korean Statistical Information Service. "Marriages by Foreign Bride's Nationality for Provinces." Statistical Database, April 7, 2016. http://kosis.kr/eng/statisticsList/statisticsList_01List.jsp?vwcd=MT_ETITLE&parmTabId=M_01_01#SubCont. Kurimoto, Eisei. "Nihonteki Tabunka Kyosei No Genkai To Kanosei (日本的 多文化共生の限界と可能性)." Mirai Kyosei Gaku (未来共生学) 3, no. 1 (2016): 69–88. Lee, Byoungha. "Incorporating Foreigners in Korea: The Politics of Differentiated Membership." The Journal of Multicultural Society 1, no. 2 (2010): 35–64. Lee, Hye-Kyung. "International Marriage and the State in South Korea: Focusing on Governmental Policy." Citizenship Studies 12, no. 1 (February 2008): 107–23. doi:10.1080/13621020701794240. ———. "The Role of Multicultural Families in South Korean Immigration Policy." In Asian Women and Intimate Work, edited by Emiko Ochiai and Kaoru Aoyama, 289–312. Leiden: Koninklijke Brill NV, 2014. Lee, Hyunok. "Political Economy of Cross-Border Marriage: Economic Development and Social Reproduction in Korea." Feminist Economics 18, no. 2 (2012): 177–200. doi:10.1080/13545701.2012.688139. Lee, Kwang Kyu. "Confucian Tradition in the Contemporary Korean Family." In Confucianism and the Family, edited by Walter H. Slote and George A. De Vos, 231–48. Albany: State University of New York Press, 1998. Lee, Yean-Ju, Dong-Hoon Seol, and Sung-Nam Cho. 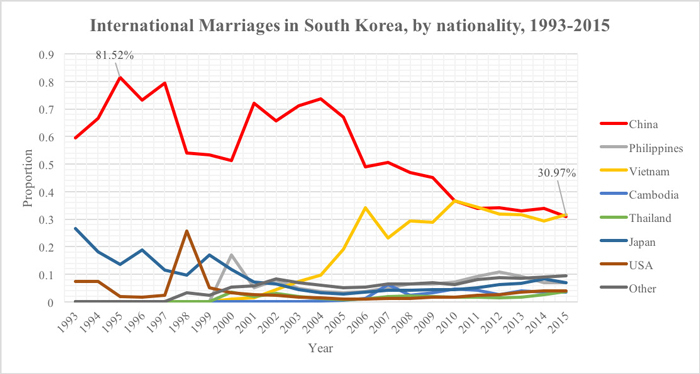 "International Marriages in South Korea: The Significance of Nationality and Ethnicity." Journal of Population Research 23, no. 2 (2006): 165–82. doi:10.1007/BF03031814. Lie, John. Multiethnic Japan. Cambridge, Mass. : Harvard University Press, 2001. ———. "The Discourse of Japaneseness." In Japan and Global Migration: Foreign Workers and the Advent of a Multicultural Society, edited by Mike Douglass and Glenda Susan Roberts, 70–90. New York: Routledge, 2000. Lim, Timothy. "Rethinking Belongingness in Korea: Transnational Migration, 'Migrant Marriages' and the Politics of Multiculturalism." Pacific Affairs 83, no. 1 (2010): 51–71. McCabe, Kristen, Serena Yi-Ying Lin, Hiroyuki Tanaka, and Piotr Plewa. "Pay to Go: Countries Offer Cash to Immigrants Willing to Pack Their Bags." Migration Policy Institute, November 5, 2009. http://www.migrationpolicy.org/article/paygocountries-offer-cash-immigrants-willing-pack-their-bags. Ministry for Health, Welfare and Family Affairs, Republic of Korea. "Let's Live a Happy Life in Korea: Guide Book for Marriage-Based Immigrants in Korea," October 2011. http://www.129.go.kr. Ministry of Gender Equality and Family, Republic of Korea. "2016 Guidebook for Living in Korea: Guidance for Multicultural Families and Foreigners Living in Korea," October 2016. http://liveinkorea.kr/global/guidebook/guidebook.asp. ———. "Rainbow+ Webzine," January 2015. http://www.liveinkorea.kr/liveinkoreaData/rainbowpdf/en_2015_1.pdf. Ministry of Government Legislation, Republic of Korea. "Support for Multicultural Families Act." Korean Laws in English. Accessed December 11, 2016. http://www.moleg.go.kr/english/. Ministry of Health and Welfare, Republic of Korea. "A Guidebook for Marriage Migrants," November 2007. https://www.scribd.com/document/75867974/2007-Guidebook-for-Marriage-Migrants. Ministry of Health, Labour and Welfare, Japan. "Nikkeijin Rishokusha Ni Taisuru Kikoku Shien Jigyou No Jisshi Ni Tsuite (日系人離職者に対する帰国支援事業の実施について)," March 31, 2009. http://www.mhlw.go.jp/houdou/2009/03/h0331-10.html. Ministry of Internal Affairs and Communications, Japan. "Tabunka Kyosei No Suishin Ni Kansuru Kenkyukai Hokokusho (多文化共生の推進に 関する研究会報告書)," March 2006. http://www.soumu.go.jp/main_content/000400765.pdf. Ministry of Justice, Japan. "Heisei 28-Nen 6-Gatsumatsu Genzai Ni Okeru Zairyuu Gaikokujin Nitsuite (Kakuteichi) (平成28年6月末現在における在 留外国人数について（確定値）)," September 27, 2016. http://www.moj.go.jp/nyuukokukanri/kouhou/nyuukokukanri04_00060.html. Mita, Chiyoko, Yuichi Koike, Yuji Tanaka, and Toshio Yanagida. "Gaikokujin Rodosha Seikatsu Jittai Chosa Kekka (外国人就労者生活実態調査結果)." Tokyo, Japan: Sophia University, October 2009. http://pweb.sophia.ac.jp/cmita/NRC091106.pdf. Morris-Suzuki, Tessa. "Immigration and Citizenship and Contemporary Japan." In Japan – Change and Continuity, edited by Jeff Graham, Javed Maswood, and Hideaki Miyajima, 163–78. London: Routledge, 2002. Noguchi, Sho. "Wagakuni Ni Okeru Gaikokujin Rodosha Wo Meguru Jyokyou Ni Tsuite (わが国における外国人労働者を巡る状況について)." Presentation presented at the Dai 50kai Rodo Seisaku Foraum (第50回労働政策フォ ーラム), Tokyo, Japan, December 4, 2010. Pak, Katherine Tegtmeyer. "Cities and Local Citizenship in Japan: Overcoming Nationality?" In Local Citizenship in Recent Countries of Immigration: Japan in Comparative Perspective, edited by Takeyuki Tsuda, 65–96. Oxford: Lexington Books, 2006. Quan, Xin-zi. "'Chaoxianzu Xinniang' Zai Hanguo—Tongzu Yiguo De Wenhua Zhongtu ('朝鲜族新娘'在韩国—同族异国的文化冲突)." Shijie Zhishi ( 世界知识), 2006. ———. "Lun Kuaguo Minzu Rentong De Changjing Yu Chayi—Yi Zhongguo Chaoxianzu Hunyin Yimin Nuxing Wei Li (论跨国民族认同的场景与差异— 以中国朝鲜族婚姻移民女性为例)." Yanbian Daxue Xuebao Shehui Kexueban ( 延边大学学报社会科学版) 45, no. 5 (2012): 87–94. Sasaki, Koji. "Between Emigration and Immigration: Japanese Emigrants to Brazil and Their Descendants in Japan." Transnational Migration in East Asia Senri Ethnological Reports 77 (2008): 53–66. Schubert, Amelia L., Youngmin Lee, and Hyun-Uk Lee. "Reproducing Hybridity in Korea: Conflicting Interpretations of Korean Culture by South Koreans and Ethnic Korean Chinese Marriage Migrants." Asian Journal of Women's Studies 21, no. 3 (2015): 232–51. doi:10.1080/12259276.2015.1072940. Seol, Dong-Hoon, and John D. Skrentny. "Ethnic Return Migration and Hierarchical Nationhood: Korean Chinese Foreign Workers in South Korea." Ethnicities 9, no. 2 (2009): 147–74. doi:10.1177/1468796808099901. ———. "Joseonjok Migrant Workers' Identity and National Identity in Korea." Yonsei University, Seoul, 2004. Sharpe, Michael O. Postcolonial Citizens and Ethnic Migration: The Netherlands and Japan in the Age of Globalization. Basingstoke: Palgrave Macmillan, 2014. ———. "What Does Blood Membership Mean in Political Terms? : The Political Incorporation of Latin American Nikkeijin (Japanese Descendants) (LAN) in Japan 1990–2004." Japanese Journal of Political Science 12, no. 1 (2011): 113–42. doi:10.1017/S1468109910000253. ———. "When Ethnic Returnees Are de Facto Guestworkers: What Does the Introduction of Latin American Japanese Nikkeijin (Japanese Descendants) (LAN) Suggest for Japan's Definition of Nationality, Citizenship, and Immigration Policy?" Policy and Society 29, no. 4 (2010): 357–69. doi:10.1016/j.polsoc.2010.09.009. Shin, Gi-Wook, and Paul Yunsik Chang. "The Politics of Nationalism in U.S.-Korean Relations." Asian Perspective 28, no. 4 (2004): 119–45. Takezawa, Yasuko. "Jo: Tabunka Kyosei No Genjou To Kadai (序 : 多文化共生 の現状と課題)." Bunka Jinrui Gaku (文化人類学) 74, no. 1 (2009): 86–95. Tsuda, Takeyuki. Strangers in the Ethnic Homeland: Japanese Brazilian Return Migration in Transnational Perspective. New York: Columbia University Press, 2003. ———. "Transnational Migration and the Nationalization of Ethnic Identity among Japanese Brazilian Return Migrants." Ethos 27, no. 2 (1999): 145–79. Woo-Gil, Choi. "The Korean Minority in China: The Change of Its Identity." Development and Society 30, no. 1 (2001): 119–141. Yamamoto, Kahori. "'Tabunka Kyosei Shisaku' Ga Miotoshitekita Mono─Keizai Fukyou Shita Ni Okeru Burajirujin (「多文化共生施策」が見落としてき たもの─経済不況下におけるブラジル人)." Kaigai Ijyu Shiryoukan Kenkyu Kiyou (海外移住資料館研究紀要) 5, no. 1 (2011): 33–44. Yamanaka, Keiko. "'I Will Go Home, But When?' Labor Migration and Circular Diaspora Formation by Japanese Brazilians in Japan." In Japan and Global Migration: Foreign Workers and the Advent of a Multicultural Society, edited by Mike Douglass and Glenda Roberts, 123–52. London: Routledge, 2000. ———. "Return Migration of Japanese-Brazilians to Japan: The Nikkeijin as Ethnic Minority and Political Construct." Diaspora: A Journal of Transnational Studies 5, no. 1 (1996): 65–97. doi:10.1353/dsp.1996.0002. John Lie, "The Discourse of Japaneseness," in Japan and Global Migration: Foreign Workers and the Advent of a Multicultural Society, ed. Mike Douglass and Glenda Susan Roberts (New York: Routledge, 2000), 81. Lie's monograph, Multiethnic Japan, offers a discussion on the 'Japaneseness' equation and nihonjinron, a popular genre of texts that synonymously explores nationality, ethnicity, and culture. For an examination of the parallels between nihonjinron and Korean nation identity, see Kyung-koo Han, "The Anthropology of the Discourse on the Koreanness of Koreans," Korea Journal 43, no. 1 (2003): 5–31. Christian Joppke, Selecting by Origin: Ethnic Migration in the Liberal State (Cambridge, Mass. : Harvard University Press, 2005), 4. Rudd Koopmans and Paul Statham, "How National Citizenship Shapes Transnationalism: Migrant and Minority Claims-Making in Germany, Great Britain and the Netherlands," in Toward Assimilation and Citizenship: Immigrants in Liberal Nation-States, ed. Christian Joppke and Ewa Morawska (Palgrave Macmillan, 2003), 201. Because Japanese census data is based on nationality (kokuseki), not ethnicity or race, the numbers cited here technically refer to the number of residents with Brazilian nationality in Japan without regard to their ethnicity, nikkeijin or otherwise. The Japanese-language literature, however, makes the assumption that Zainichi Brazilians refer to nikkeijin Brazilians who entered Japan on preferential immigration policies, so I do the same. Ministry of Health, Labour and Welfare, Japan, "Nikkeijin Rishokusha Ni Taisuru Kikoku Shien Jigyou No Jisshi Ni Tsuite (日系人離職者に対する帰国支援事業の実施について)," March 31, 2009, http://www.mhlw.go.jp/houdou/2009/03/h0331-10.html. Kristen McCabe et al., "Pay to Go: Countries Offer Cash to Immigrants Willing to Pack Their Bags," Migration Policy Institute, November 5, 2009, http://www.migrationpolicy.org/article/pay-go-countries-offer-cash-immigrants-willing-pack-their-bags. Yihua Hong, Changzoo Song, and Julie Park, "Korean, Chinese, or What? Identity Transformations of Chosŏnjok (Korean Chinese) Migrant Brides in South Korea," Asian Ethnicity 14, no. 1 (2013): 30, doi:10.1080/14631369.2012.703074. Korean Institute for Healthy Family, "Multicultural Information: Multicultural Families Statistic," Danuri, accessed November 29, 2016, http://www.liveinkorea.kr/homepage/en/multidata/statisticsFamily.asp?language=EN&mc=M0031. Ministry of Justice, Japan, "Heisei 28-Nen 6-Gatsumatsu Genzai Ni Okeru Zairyuu Gaikokujin Nitsuite (Kakuteichi) (平成28年6月末現在における在留外国人数につ いて（確定値）)," September 27, 2016, http://www.moj.go.jp/nyuukokukanri/kouhou/nyuukokukanri04_00060.html. Similar to the Brazilian nikkeijin case, the statistics in Figure 2 includes Chinese, non-ethnic Korean spouses in international marriage, since discrete statistics about joseonjok are not available in the English language. Since the Support for Multicultural Families Act is not a policy that only targets joseonjok, the statistics may reflect how the policy neglects the specific interests of joseonjok brides. Korean Statistical Information Service, "Marriages by Foreign Bride's Nationality for Provinces," Statistical Database, April 7, 2016, http://kosis.kr/eng/statisticsList/statisticsList_01List.jsp?vwcd=MT_ETITLE&parmTabId=M_01_01#SubCont. Tsuda, Strangers in the Ethnic Homeland, 131. Joppke, Selecting by Origin, ix. Joppke, Contesting Ethnic Immigration., 95. Dorinne K. Kondo, "Dissolution and Reconstitution of Self: Implications for Anthropological Epistemology," Cultural Anthropology 1, no. 1 (1986): 76. Dong-Hoon Seol and John D. Skrentny, "Ethnic Return Migration and Hierarchical Nationhood: Korean Chinese Foreign Workers in South Korea," Ethnicities 9, no. 2 (2009): 150–51, doi:10.1177/1468796808099901. Daniela De Carvalho, Migrants and Identity in Japan and Brazil: The Nikkeijin (London: RoutledgeCurzon, 2003), 4. Michael O. Sharpe, Postcolonial Citizens and Ethnic Migration: The Netherlands and Japan in the Age of Globalization (Basingstoke: Palgrave Macmillan, 2014), 119. Koji Sasaki, "Between Emigration and Immigration: Japanese Emigrants to Brazil and Their Descendants in Japan," Transnational Migration in East Asia Senri Ethnological Reports 77 (2008): 54. Sharpe, Postcolonial Citizens and Ethnic Migration, 122. Keiko Yamanaka, "Return Migration of Japanese-Brazilians to Japan: The Nikkeijin as Ethnic Minority and Political Construct," Diaspora: A Journal of Transnational Studies 5, no. 1 (1996): 73, doi:10.1353/dsp.1996.0002. Fukui Chizu, "Nanbei Nikkeijin Ni Kakawaru Mondai To Kaketsusaku No Ichi Kousatsu (南 米日系人に関わる問題と解決策の一考察)," Takasaki Keizai Daigaku Ronshu (高崎経済大 学論集) 52, no. 2 (2009): 74. Takeyuki Tsuda, Strangers in the Ethnic Homeland: Japanese Brazilian Return Migration in Transnational Perspective (New York: Columbia University Press, 2003), 90-91. Yamanaka, "'I Will Go Home, But When? '", 134. Yasuki Izawa, "'Tabunka Kyousei' no Sogo: Zainichiburajirujin No Genjou to Shisaku No Seigou/Fuseigou (「多文化共生」の齟齬 : 在日ブラジル人の現状と施策の整合/不 整合)," Toyo Daigaku Ningenkagaku Sougoukenkyusho Kiyou (東洋大学人間科学総合研究所 紀要), no. 15 (2013): 88. Michael O. Sharpe, "What Does Blood Membership Mean in Political Terms? : The Political Incorporation of Latin American Nikkeijin (Japanese Descendants) (LAN) in Japan 1990–2004," Japanese Journal of Political Science 12, no. 1 (2011): 123, doi:10.1017/ S1468109910000253. Michael O. Sharpe, "When Ethnic Returnees Are de Facto Guestworkers: What Does the Introduction of Latin American Japanese Nikkeijin (Japanese Descendants) (LAN) Suggest for Japan's Definition of Nationality, Citizenship, and Immigration Policy?," Policy and Society 29, no. 4 (2010): 369, doi: 10.1016/j.polsoc.2010.09.009. Higuchi Naoto, "Keizaikiki To Zainichi Burajirujin: Nani Ga Tairyou Shitsugyou Kikoku Wo Motarashita Noka (経済危機と在日ブラジル人:何が大量失業・帰国をもたらしたの か)," Oohara Shakaimondai Kenkyujo Zasshi (大原社会問題研究所雑誌), no. 622 (2010), 53. Kahori Yamamoto, "'Tabunka Kyosei Shisaku' Ga Miotoshitekita Mono─Keizai Fukyou Shita Ni Okeru Burajirujin (「多文化共生施策」が見落としてきたもの─経済不況下におけ るブラジル人)," Kaigai Ijyu Shiryoukan Kenkyu Kiyou (海外移住資料館研究紀要) 5, no. 1 (2011): 35-36. There is a fifth category in the Action Plan with regards to raising children (子供を大切に 育てていくために) that I will not analyze. It is unfortunately beyond the scope of my analysis to examine the integration of Brazilian nikkeijin youth – those born in Japan to the migrant workers – in the Japanese education system. To reconcile the contradiction created by the Ministry of Justice of having foreign laborers with no immigration policy, local governments such as those in Kawasaki and Hamamatsu autonomously assisted foreign residents by providing them with targeted services and involving them in foreign resident councils. For a discussion of incorporation policies created by local governments, see Katherine Tegtmeyer Pak, "Cities and Local Citizenship in Japan: Overcoming Nationality?," in Local Citizenship in Recent Countries of Immigration: Japan in Comparative Perspective, ed. Takeyuki Tsuda (Oxford: Lexington Books, 2006), 65–96. The original Japanese reads as follows: "今後もこれらの人々の定住を認める以上、日 本社会の一員として受け入 れ、社会から排除されないようにするための施策を国 の責任として講じていくことが必要である。" See Cabinet Office, Japan, "Nikkei Teiju Gaikokujin Shisaku Ni Kansuru Kihon Shishin." Nanako Inaba and Naoto Higuchi, "Ushinawareta 20 Nen: Zainichi Nanbeijin Ha Naze Kyugen Shitanoka (失われた20年: 在日南米人はなぜ急減したのか)," Ibaraki Daigaku Jinbun Gakubu Kiyou Jinbun Komyunikeshon Gakka Ronshu (茨城大学人文学部紀要人文コ ミュニケーション学科論集) 14, no. 1 (2013): 9. Cabinet Office, Japan, "Nikkei Teiju Gaikokujin Shisaku Ni Kansuru Kihon Shishin (日系定住外国人施策に関する基本指針)," August 31, 2010, http://www8.cao.go.jp/teiju/guideline/pdf/fulltext.pdf. Chris Burgess, "'It's Better If They Speak Broken Japanese': Language as a Pathway or an Obstacle to Citizenship in Japan?," in Language and Citizenship in Japan, ed. Nanette Gottlieb (New York: Routledge, 2012), 39. Cabinet Office, Japan, "Nikkei Teiju Gaikokujin Shisaku (日系定住外国人施策)," accessed December 11, 2016, http://www8.cao.go.jp/teiju/index.html. Chiyoko Mita et al., "Gaikokujin Rodosha Seikatsu Jittai Chosa Kekka (外国人就労者 生活実態調査結果)" (Tokyo, Japan: Sophia University, October 2009), http://pweb.sophia.ac.jp/cmita/NRC091106.pdf. Cabinet Office, Japan, "Nikkei Teiju Gaikokujin Shisaku Ni Kansuru Kihon Shishin." Personal accounts best illustrate how the Brazilian nikkeijin were "cultural disappointments" to the homeland population. See Tsuda, Strangers in the Ethnic Homeland, 157-171. Takeyuki Tsuda, "Transnational Migration and the Nationalization of Ethnic Identity among Japanese Brazilian Return Migrants," Ethos 27, no. 2 (1999): 147. Tsuda, Strangers in the Ethnic Homeland, 117. Sho Noguchi, "Wagakuni Ni Okeru Gaikokujin Rodosha Wo Meguru Jyokyou Ni Tsuite (わ が国における外国人労働者を巡る状況について)" (Presentation, Dai 50kai Rodo Seisaku Foraum (第50回労働政策フォーラム), Tokyo, Japan, December 4, 2010). Izawa, "'Tabunka Kyousei' no Sogo," 91. Burgess, "'It's Better If They Speak Broken Japanese,'" 47. Citing a 1997 survey, Tsuda states: "A third, 33.6 percent, live in apartments where over 25 percent of the residents are other nikkeijin and only 12.7 percent of them live in apartments with only Japanese residents." See Tsuda, Strangers in the Ethnic Homeland, 162. In the post-2008 recession context, recent surveys on foreign laborers focus more on their employment conditions rather than residential segregation. The original Japanese reads as follows: "日系定住外国人のための施策を進めるに当た っては、日系定住外国人自身が日本の文化・慣習を十分に理解することが重要で ある一方、彼らを日本社会の一員として受け入れることが、将来に向かって社会の 活力になること、そのためにはお互いの文化を尊重しながら受け入れていくことが重要であることについて、日本国民の理解を深めていくことが重要である。" See Cabinet Office, Japan, "Nikkei Teiju Gaikokujin Shisaku Ni Kansuru Kihon Shishin." Yamamoto, "'Tabunka Kyosei Shisaku' Ga Miotoshitekita Mono," 36. Tsuda, Strangers in the Ethnic Homeland, 193. John Lie, Multiethnic Japan (Cambridge, Mass. : Harvard University Press, 2001), 50. Tsuda, Strangers in the Ethnic Homeland, 124. Carvalho, Migrants and Identity in Japan, 116. Tsuda, Strangers in the Ethnic Homeland, 134. Taro Fujita and Ippei Nakada, "Burajiru Ouen, Takamaru Netsu (ブラジル応援、高まる 熱)," Asahi Shimbun, June 7, 2014, Morning edition, sec. Shakai (社会). Ministry of Internal Affairs and Communications, Japan, "Tabunka Kyosei No Suishin Ni Kansuru Kenkyukai Hokokusho (多文化共生の推進に関する研究会報告書)," March 2006, http://www.soumu.go.jp/main_content/000400765.pdf. Izawa, "'Tabunka Kyousei' no Sogo," 96. Eisei Kurimoto, "Nihonteki Tabunka Kyosei No Genkai To Kanosei (日本的多文化共生の 限界と可能性)," Mirai Kyosei Gaku (未来共生学) 3, no. 1 (2016): 78. Yasuko Takezawa, "Jo: Tabunka Kyosei No Genjou To Kadai (序:多文化共生の現状と課 題)," Bunka Jinrui Gaku (文化人類学) 74, no. 1 (2009): 91. Chiharuya, "Oizumimachi Kankyo Kyokai (大泉町観光協会)," accessed December 19, 2016, http://www.oizumimachi-kankoukyoukai.jp/index.html. Tessa Morris-Suzuki, "Immigration and Citizenship and Contemporary Japan," in Japan – Change and Continuity, eds. Jeff Graham, Javed Maswood, and Hideaki Miyajima (London: Routledge, 2002), 171. Sharpe, "What Does Blood Membership Mean in Political Terms?," 131. Toshio Japan Center for International Exchange, "'Tabunka Kyosei To Gaikokujin Ukeire' Ni Kansuru Jichitai Ankete (「多文化共生と外国人受け入れ」に関する自治体アンケート 2015調査結果報告書)" (Tokyo, Japan: Japan Center for International Exchange, November 27, 2015), 18. Tsuda argues that honne and tatemae in the "Japanese self " allows the homeland population to conceal their "true inner attitudes and feelings" in public, making discrimination against Brazilian nikkeijin subtle and indirect. See Tsuda, Strangers in the Ethnic Homeland, 141-151. Petrice R. Flowers, "From Kokusaika to Tabunka Kyosei: Global Norms, Discourses of Difference, and Multiculturalism in Japan," Critical Asian Studies 44, no. 4 (2012): 528, doi:10.1 080/14672715.2012.738540. Chikako Kashiwazaki, "Multicultural Discourse and Policies in Japan: An Assessment of Tabunka Kyōsei," The Gakushuin Journal of International Studies 3, no. 1 (2016): 7. Dong-Hoon Seol and John D. Skrentny, "Joseonjok Migrant Workers' Identity and National Identity in Korea" (Korean Identity: Past and Present, Yonsei University, Seoul, 2004), 3. Choi Woo-Gil, "The Korean Minority in China: The Change of Its Identity," Development and Society 30, no. 1 (2001): 1121. Jaeeun Kim, Contested Embrace: Transborder Membership Politics in Twentieth-Century Korea (Stanford University Press, 2016), 182. Amelia L. Schubert, Youngmin Lee, and Hyun-Uk Lee, "Reproducing Hybridity in Korea: Conflicting Interpretations of Korean Culture by South Koreans and Ethnic Korean Chinese Marriage Migrants," Asian Journal of Women's Studies 21, no. 3 (2015): 235, doi:10.1080/1225 9276.2015.1072940. Gi-Wook Shin and Paul Yunsik Chang, "The Politics of Nationalism in U.S.-Korean Relations," Asian Perspective 28, no. 4 (2004): 122. Caren Freeman, Making and Faking Kinship: Marriage and Labor Migration between China and South Korea (Ithaca: Cornell University Press, 2011), 43. Amelia L. Schubert, Youngmin Lee, and Hyun-Uk Lee, "Reproducing Hybridity in Korea: Conflicting Interpretations of Korean Culture by South Koreans and Ethnic Korean Chinese Marriage Migrants," Asian Journal of Women's Studies 21, no. 3 (2015): 236, doi:10.1080/122592 76.2015.1072940. Xin-zi Quan, "'Chaoxianzu Xinniang' Zai Hanguo—Tongzu Yiguo De Wenhua Zhongtu (' 朝鲜族新娘'在韩国—同族异国的文化冲突)," Shijie Zhishi (世界知识), 2006, 54. Hye-Kyung Lee, "The Role of Multicultural Families in South Korean Immigration Policy," in Asian Women and Intimate Work, eds. Emiko Ochiai and Kaoru Aoyama (Leiden: Koninklijke Brill NV, 2014), 296. Yean-Ju Lee, Dong-Hoon Seol, and Sung-Nam Cho, "International Marriages in South Korea: The Significance of Nationality and Ethnicity," Journal of Population Research 23, no. 2 (2006): 172, doi:10.1007/BF03031814. Schubert, Lee, and Lee, "Reproducing Hybridity in Korea," 233. Gyuchan Kim and Majella Kilkey, "Marriage Migration Policy as a Social Reproduction System: The South Korean Experience," in Family Life in an Age of Migration and Mobility, eds. Majella Kilkey and Ewa Palenga-Möllenbeck, Migration, Diasporas and Citizenship (Basingstoke: Palgrave Macmillan, 2016), 151, doi:10.1057/978-1-137-52099-9_7. Schubert, Lee, and Lee, "Reproducing Hybridity in Korea," 236. Lee, "The Role of Multicultural Families," 298. Schubert, Lee, and Lee, "Reproducing Hybridity in Korea," 237. For a discussion of the 'Grand Plan' in the English language, see Hye-Kyung Lee, "International Marriage and the State in South Korea: Focusing on Governmental Policy," Citizenship Studies 12, no. 1 (February 2008): 107–23, doi:10.1080/13621020701794240. Byoungha Lee, "Incorporating Foreigners in Korea: The Politics of Differentiated Membership," The Journal of Multicultural Society 1, no. 2 (2010): 60. Ministry of Government Legislation, Republic of Korea, "Support for Multicultural Families Act," Korean Laws in English, accessed December 11, 2016, http://www.moleg.go.kr/english/. Hyun Mee Kim, "The Emergence of the 'Multicultural Family' and Genderized Citizenship in South Korea," in Contested Citizenship in East Asia: Developmental Politics, National Unity, and Globalization, ed. Kyung-Sup Chang and Bryan S. Turner (Oxon: Routledge, 2012), 208. Ministry of Government Legislation, Republic of Korea, "Support for Multicultural Families Act." Sookyung Kim, "Soft Talk, Hard Realities: Multiculturalism as the South Korean Government's Decoupled Response to International Migration," Asian and Pacific Migration Journal 24, no. 1 (March 1, 2015): 65, doi:10.1177/0117196814565165. The Let's live a happy life in Korea guide refers to "Transnational Marriage & Family-support Centers," which is an early official English-language translation of the Multicultural Family Support Centers. Ministry for Health, Welfare and Family Affairs, Republic of Korea, "Let's Live a Happy Life in Korea: Guide Book for Marriage-Based Immigrants in Korea," October 2011, http://www.129.go.kr. Kim and Kilkey, "Marriage Migration Policy as a Social Reproduction System," 150. Ministry of Gender Equality and Family, "2016 Guidebook for Living in Korea: Guidance for Multicultural Families and Foreigners Living in Korea," October 2016, http://liveinkorea.kr/global/guidebook/guidebook.asp. 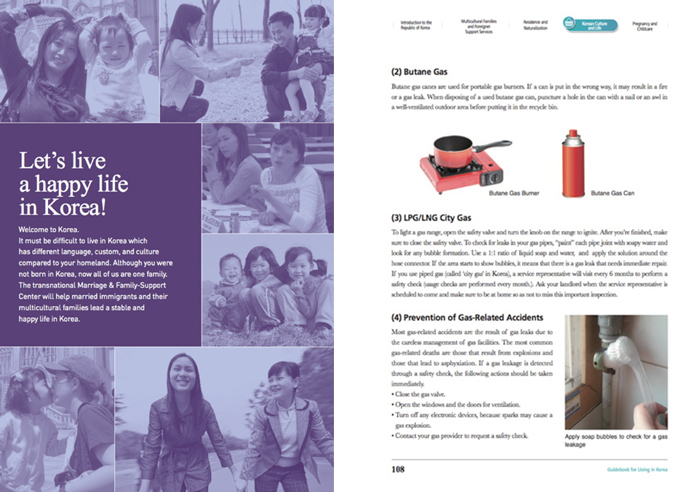 Ministry of Gender Equality and Family, Republic of Korea, "2016 Guidebook for Living in Korea: Guidance for Multicultural Families and Foreigners Living in Korea," October 2016, http://liveinkorea.kr/global/guidebook/guidebook.asp. Kwang Kyu Lee, "Confucian Tradition in the Contemporary Korean Family," in Confucianism and the Family, ed. Walter H. Slote and George A. De Vos (Albany: State University of New York Press, 1998), 257. Kim, "The Emergence of the 'Multicultural Family' and Genderized Citizenship in South Korea," 212. For an extensive discussion on gender roles from the joseonjok perspective, see Freeman, Making and Faking Kinship, 109-152. Freeman, Making and Faking Kinship, 134. Schubert, Lee, and Lee, "Reproducing hybridity in Korea," 240. Xin-zi Quan, "Lun Kuaguo Minzu Rentong De Changjing Yu Chayi—Yi Zhongguo Chaoxianzu Hunyin Yimin Nuxing Wei Li (论跨国民族认同的场景与差异—以中国朝鲜族 婚姻移民女性为例)," Yanbian Daxue Xuebao Shehui Kexueban (延边大学学报社会科学版) 45, no. 5 (2012): 90. Freeman, Making and Faking Kinship, 115. The original Chinese reads as follows: "他都嫌我的嗓门大，若与他解释，他就说顶 嘴，不像女人，没有女人味等，你如果生气与他顶嘴，那就肯定遭暴力。" See Quan, "Lun Kuaguo Minzu Rentong De Changjing Yu Chayi," 90. Schubert, Lee, and Lee, "Reproducing hybridity in Korea," 235. Minjeong Kim, "South Korean Rural Husbands, Compensatory Masculinity, and International Marriage," Journal of Korean Studies 19, no. 2 (2014): 303, doi:10.1353/ jks.2014.0030. Ministry of Health and Welfare, Republic of Korea, "A Guidebook for Marriage Migrants," November 2007, https://www.scribd.com/document/75867974/2007-Guidebook-forMarriage-Migrants. Ministry of Gender Equality and Family, Republic of Korea, "Rainbow+ Webzine," January 2015, http://www.liveinkorea.kr/liveinkoreaData/rainbowpdf/en_2015_1.pdf. Ministry of Gender Equality and Family, "2016 Guidebook for Living in Korea: Guidance for Multicultural Families and Foreigners Living in Korea." Sookyung Kim, "Soft Talk, Hard Realities," 69. Hyunok Lee, "Political Economy of Cross-Border Marriage: Economic Development and Social Reproduction in Korea," Feminist Economics 18, no. 2 (2012): 179, doi:10.1080/135457 01.2012.688139.